The Grinch Returns! Monsanto Doesn’t Want to Allow Elderly, Suffering Cancer Patients Have an Expedited Trial! Getting justice for victims of cancer is no easy task. Especially if the person filing a lawsuit suffers from leukemia, non- Hodgkin’s lymphoma or myeloma. These three cancers are particularly deadly. And many medical experts and scientists say they are tied to glyphosate exposure, the active ingredient in Monsanto’s Roundup and Ranger Pro herbicides. Court cases often drag on for several years. They can last even longer in states like California and Florida. That makes it especially difficult for terminal cancer patients to get their day in court. The Constitution guaranties us the right to seek redress in court but when delays drag out cases for years, getting justice can be tough. In June 2017, Alva Pilliod sued Monsanto claiming he contracted cancer because of exposure to glyphosate. Alva is 76. Now he is seeking to amend his complaint to add his wife, 74-year-old Alberta Pilliod, and to seek an expedited trial date. Since his original suit was filed his wife has also been diagnosed with lymphoma. The Pilliods asked Alameda Superior Court Judge Ioana Petrou (Oakland CA) for an expedited trial date. They are hoping to be heard before next spring. Although both their cancers are in partial remission, age and chemotherapy are taking its toll on the couple. Unfortunately, chemo often has terrible side effects. The Pilliods’ say they are experiencing hearing and memory loss, neuropathy in their toes, seizures and “constant discomfort.” A Law360 media report says that Alva and Alberta Pilliod were sitting in court this week with matching canes. The Pilliods don’t want to wait until they are hospice patients or worse before they get their day in court. Does Monsanto care? Evidently not. They told the judge that the Pilliods shouldn’t get special treatment such as an early trial date. Perhaps they are simply hoping that the Pilliods never make it to trial. We were heartened by the recent $289 million jury verdict in nearby San Francisco in favor of a former school groundskeeper who was diagnosed with cancer. Unfortunately, he won’t see a dime of his award. He is late stage 4 cancer with just months to live. Monsanto has vowed to appeal and won’t pay the verdict. It is likely years before the appeals are exhausted. By then, DeWayne Johnson, the “winner” of the $289 million verdict, will be dead. It is hard to call anyone with cancer a winner. Especially if the company who lost won’t pay the money while the victim remains alive. It is not just the delays that frustrate cases involving cancer patients. People suffering from life threatening ailments have more important things to do than worry about trials and court battles. We understand that and the unique issues associated with cancer victims. Many people we speak with are fighting these battles simply to protect others from the same fate. Some victims also want to insure their loved ones are properly cared for. Unfortunately, no amount of money can make the cancer disappear. (1) The party has a substantial interest in the action as a whole. (2) The health of the party is such that a preference is necessary to prevent prejudicing the party’s interest in the litigation. Thankfully California’s Legislature and courts recognize that people who are facing terminal illness should be assured of their day in court. Judge Petrou is expected to rule on November 7th. Monsanto should be deeply ashamed for suggesting the Pilliods be denied their right to an early trial. The court already ruled that Alberta can join the case. California’s statutory right to an expedited trial applies only to those 70 or older. Courts nationwide, however, have the inherent right to control their dockets and can still expedite trials for those showing special needs. We have long railed against Monsanto for failing to properly warn users of their popular herbicides of the dangers associated with its use. The World Health Organization says it is a probable human carcinogen and many countries ban or restrict its use. Monsanto (now Bayer) stubbornly hangs on in the U.S., however. And we believe that is because Roundup and Ranger Pro are the number one herbicides in the United States. They make billions of dollars from these products. Money talks. But is the price worth it? Worse than failing to warn of the dangers of glyphosate, Monsanto continues to tell the world that its products are safe. New evidence every day suggests otherwise but the company won’t budge from its drumbeat message of how safe the product is. We are actively seeking new cancer victim clients that were exposed to Roundup. If you were a landscaper, groundskeeper or golf course greenskeeper, chances are good that you used Roundup. Many farmers also were exposed extensively to glyphosate. If you have non-Hodgkin’s lymphoma, myeloma or leukemia, you may have a claim for monetary damages. Homeowner? 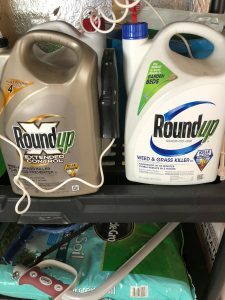 If you used Roundup consistently in your yard, you may also have a case. New studies have suggested other health problems associated with glyphosate. While we are happy to speak with you, we unfortunately cannot take your case at this time. Absent medical evidence, we are unable to prove a link between glyphosate and other diseases. We are also unable to take cases where the only exposure to glyphosate is the residual amounts found on many foods. New evidence suggests that the residuals exceed FDA tolerances but the official FDA data says otherwise. We urge everyone to read our Monsanto Roundup Cancer Claims page. That page is constantly updated as new information develops. We also have two short videos on that page that you must see. or by phone at 202-800-9791. Cases accepted nationwide. Are you a current or former employee of Monsanto or one of its testing labs? We certainly are interested in speaking with you. We are always looking for witnesses that can help us. Even if it is an anonymous conversation, we need your help in achieving justice for cancer victims worldwide.